Hinckley-based Checkprint has enjoyed its most successful year to date after achieving a record sales turnover for 2017. The organisation, a member of the TALL Group of Companies, the UK leader in the provision of secure paper and electronic payment solutions, reached a pre-audit, unconsolidated sales figure of £5.2 million, representing a like-for-like rise of 19.5% on the previous year. This growth is attributable to a number of significant factors, including the company’s highest fourth quarter on record, driven by the upsurge in demand within the banking sector for cheque image scanners. The year has also seen Checkprint grow its UK Business Process Outsourcing activities throughout 2017 with more organisations now using the company’s innovative payments bureau service to achieve time and cost savings. This growth comes on the back of securing contract renewals and service extensions with clients such as Barclays and Metro Bank at the beginning of 2017 that provided a great start to the year. 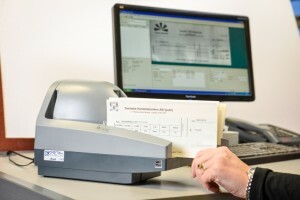 In addition, the TALL Group won major contracts to supply cheque scanners to Santander and HSBC, which are fulfilled by Checkprint on the Group’s behalf.